A Kotobukiya Japanese import! Star Wars ARTFX+ Statues bring you all of the quality and detailing that you expect from an ARTFX release in a great smaller scale perfect for collecting! Next up in this series is a unique protocol droid coming exclusively to Barnes & Noble: R-3PO! A 3PO unit with a long history, R-3 was first seen with the Rebel Alliance in Echo Base on Hoth in Star Wars Episode V: The Empire Strikes Back. However, more recently it had a cameo in the LEGO Star Wars: The Force Awakens game where it had been reprogrammed to work for the villainous First Order! 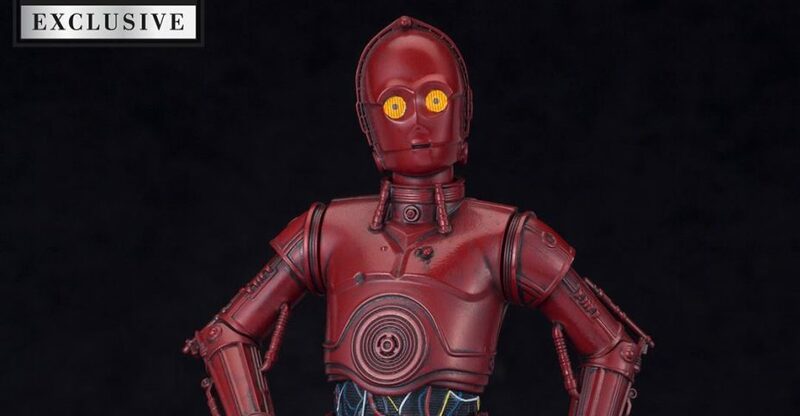 The droid shares the same humanoid body type made famous by C-3PO, though R-3PO is immediately recognizable with its deep red paint job and bright yellow “eye” sensors. ARTFX+ Statues are fun-to-assemble pre-painted snap-fit kits that can be put together easily in seconds without glue or modeling skill. 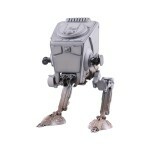 At 6 ½ inches tall R-3PO is perfectly scaled (1/10) to the figures in the ARTFX+ line and comes with magnets in its feet for extra stability on the included metal display base. Make sure all of your translation and diplomatic efforts are met with success with R-3PO at your side! Available in November exclusively at Barnes & Noble, Limited to 1500 pieces. Medicom has revealed some new Star Wars based Kubricks. Each one stands about 60mm each. There are two separate sets. One for The Empire Strikes Back and one for Return of the Jedi. Each set will sell for 16,128 Yen (about $178 USD). To see all of the photos, click the headline of the story.